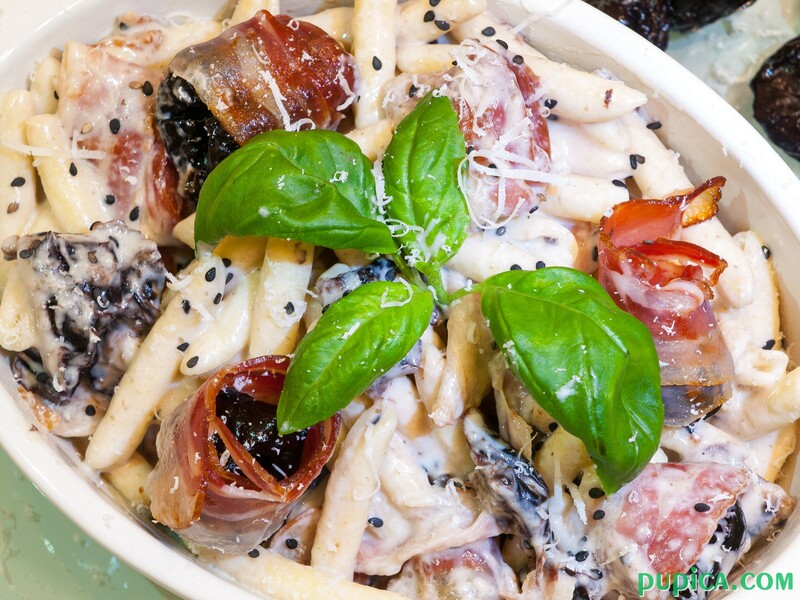 Plums are one of the most flavorful ingredients that you can use when preparing pasta and meat dishes. I love adding dried plums because they give that sweet taste to the dish that makes a perfect match with salty and crunchy bacon. Then if you add the cooking cream it will really satisfy all your taste buds. In Dalmatia region of Croatia, there is a traditional dish called “Pasticada”, stewed beef prepared with delicious vegetable and plums sauce served with gnocchi… yummy!!! I haven’t prepared it yet for this blog, but I sure will, so you can give it a look in the “search” box soon. 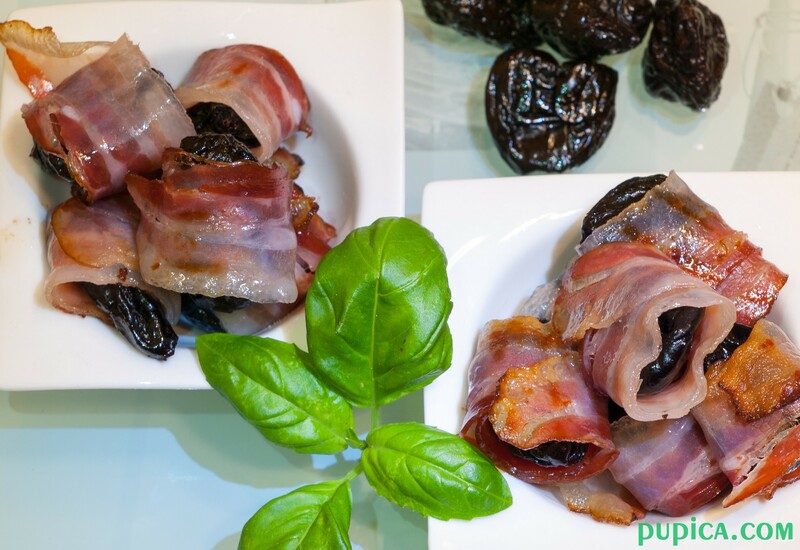 I have prepared this recipe by wrapping the plums in the bacon and then cooking them with a little oil, on a nonstick pan until the bacon becomes crunchy. But you can also dice dried plums and bacon and cook them on a pan for a couple of minutes. This recipe other than being super tasty is ready in just 15 minutes! 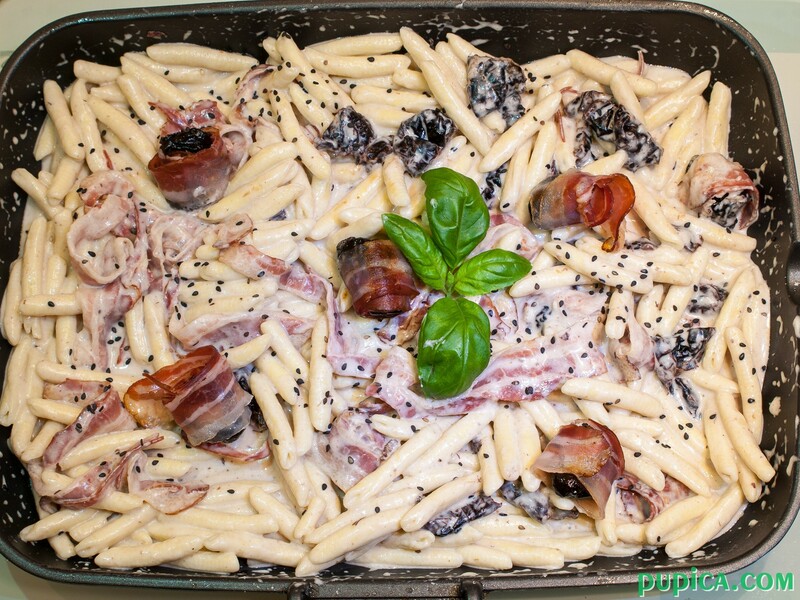 I prepared it with cooking cream, because I love creamy recipes and added lots of grated Parmesan cheese, but you can also prepare it without cooking cream and by adding just a little bit more of extra-virgin olive oil, it will be tasty as well. As you could notice in almost all of my recipes I always add seeds and herbs, not only because of the flavor but also because of the many health benefits. 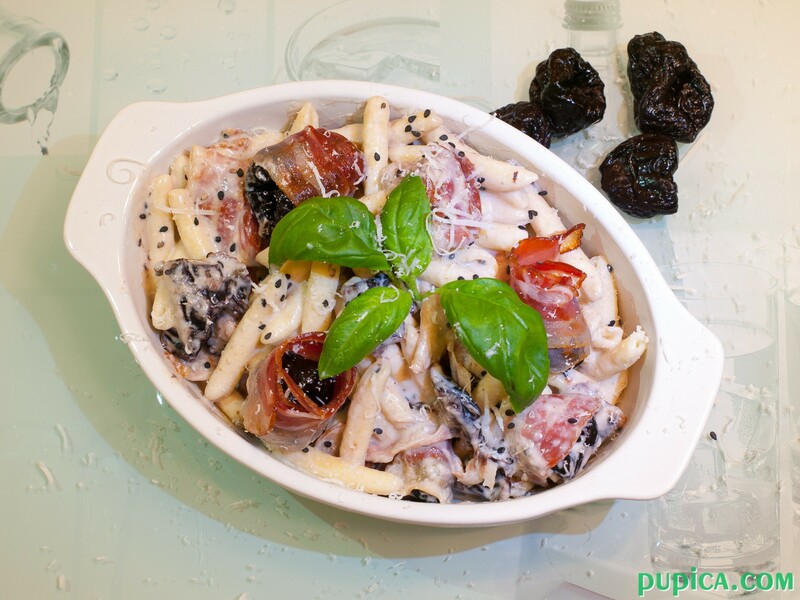 For this recipe, I have chosen basil leaves and black sesame seeds. Sesame seeds are very nutritious and they come in many different colors like white, yellow or black. To tell you the truth I have chosen the black ones just because of the color, but you can add any variety of sesame seeds. 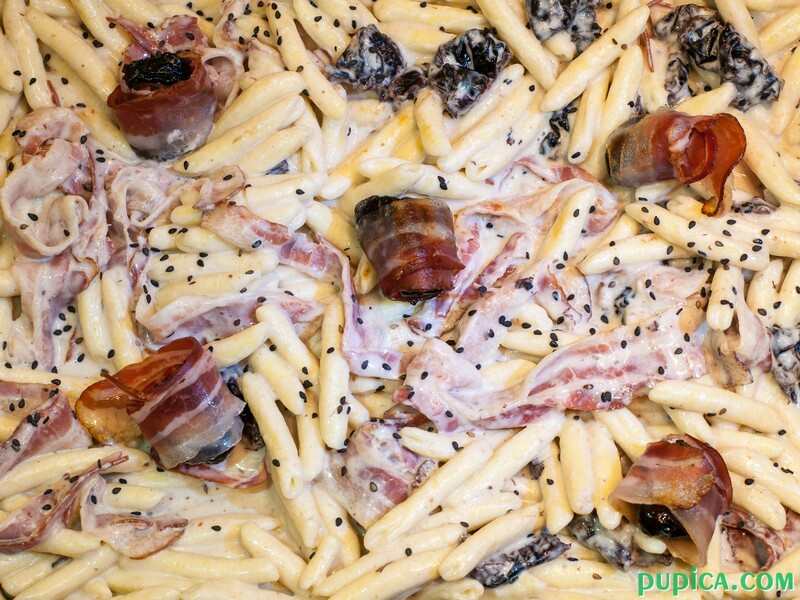 I recommend you to use short pasta for this recipe like penne, caserecce or orecchiette. 1Bring a large pot of salted water to the boil and cook the pasta as indicated on the box. 2Cut the plums into two pieces and wrap 8 pieces with bacon. 3Cut the rest of the bacon slices into smaller pieces. 4Heat the oil in a non-stick pan, add sliced plums and bacon and 8 bacon wraps. Cook until the bacon becomes golden and fat translucent. Take out 8 bacon wraps. 5Add cooking cream and Parmesan cheese in the pan. 6Add sesame seeds and thyme leaves. 7Toss well to coat and cook for 2 -3 minutes. 8Drain the pasta and mix it with the sauce. 9Toss well to coat and adjust with salt and pepper. 10Serve with wrapped plums you took out of the pan before putting the cream.